Vermis is the ancient Latin word for “worms”, so Vermicomposting is essentially the decomposition of organic material by worms. In other words, “Worm Composting”. The worms perform their magic on both waste matter and the soil producing a nutrient-rich, organic fertiliser and soil conditioner, called “vermicompost”. Generally a traditional aerobic compost heap gets too hot in its centre for anything to live there other than bacterial organisms. But in cooler compost heaps, a lot of the work of decomposition can be done by worms and a composting process that relies entirely on worms is called “vermicomposting”. Vermicomposting is an easy but fairly slow way of turning vegetable and food scraps as well as garden waste into high-quality compost and soil conditioner for use by the gardener. Another advantage of using worms, is that worms are abundant (20 to 50 per square foot), odourless, free from disease and work all year-round given the right conditions. Then, vermicomposting results in the bio-conversion of the waste stream into two useful products, “earthworm biomass” and “vermicompost”. 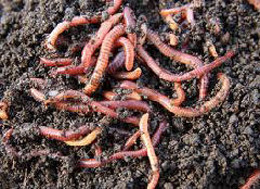 Vermicomposting uses specially bred worms to aerate the soil and convert organic matter into compost. Worms are eating machines that feed on the bacteria growing on the waste organic matter and pass it through their digestive system, producing worm castings or “worm poo”. This worm manure or vermicastings as it is politely and officially called, may be useless waste to a worm, but to a gardener it is a fantastic soil conditioner and enhancement medium. Vermicompost not only contains worm poo, but also their bedding materials and added organic wastes at various stages of decomposition allowing other micro-organisms to attach to the digested organic matter that has passed through the worm. Vermicastings are an important part of worm composting as they can be much higher in organic matter containing phosphates, nitrogen, potash and other such nutrients than plain soil which has not been processed by the worms. Also, vermicastings produced by the worms add structure to the soil improving aeration and water retention as the tunnels formed by the burrowing worms aid in the storage and passage of water, which also wash nutrients to the roots of the plants that extend quite rapidly along these horizontal tunnels. Also, vermicompost increases microbial activity, as well as suppressing soil born diseases allowing plants to grow compared to regular soil or compost. Worms are powerful eating machines providing many benefits to the average soil, but not all worms are suitable for vermicomposting as some live only on the surface or in water, some prefer different soil conditions, while others live deep below the surface of the soil. So what types of “earthworms” are suitable for vermicomposting or for use in a wormery. To create fertile soil we need the right kind of composting worms because after all its the worms that do the work. Over thousands of years, mother nature has created hundreds if not thousands of different species of earthworms distributed all over world, but only a few of these are suitable for vermicomposting. Most earthworms are terrestrial organisms, which live in the soil and are often divided into different groups by scientists with names such as: edaphologists and pedologists according to their function in the soil with the most suitable for vermicompost being the Anecic, Endogeic and Epigeic species of worms. • Anecic Worms – anecic worms feed at or near too the soil surface on plant litter or dead roots and other plant debris. They are usually larger worms that build permanent horizontal and vertical burrows in the soil and only come to the surface to pull leave bits and other food into their burrows. Anecic earthworms are called humus former’s and are capable of both organic waste consumption as well as in modifying the structure of the soil. As anecics are a burrowing species they are widely used in soil management as well as helping in compost production. Lumbricus terrestris, called the nightcrawler is a large anecic worm with a flattened tail that is great for the soil, but will not survive in an enclosed vermicomposting bin so are not considered suitable for producing vermicompost. • Endogeic Worms – endogeic worms spend most of their time below the surface in the mineral layers of soil burrowing constantly and rarely come to the surface. Endogeic worms live near the roots of plants feeding on the decaying roots, fungi and bacteria that is found there. They are a geophagous species of worm that ingests large quantities of organically rich soil turning it into vermicompost. Endogeic species, such as Aporrectodea calignosa, feed on large quantities of soil and as they burrow they produce stable earthworm casts which help to improve the soil structure by mixing and aerating the soil as they move through it creating long tunnels and cracks in the soil. Endogeic worms require deep subsoils and survive best in undisturbed areas where their burrows can remain intact making them unsuitable for composting heaps due to the constant turning over of the pile to aerate it. • Epigeic Worms – epigeic worms are surface dwellers and feed on the decayed organic materials found on the soil surface and not in the soil itself. 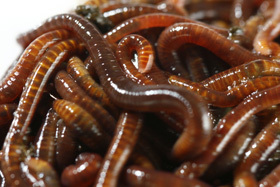 Epigeics used in vermicomposting are called red earthworms (Eisenia foetida), also known as red wiggler’s, manure worms, red hybrid or tiger worms due to their relatively high tolerance of environmental variations. They are excellent for vermicomposting. These detritivorous earthworms species also thrive in compost bins and enclosed wormeries. Epigeic worms reproduce quickly and in one day can eat their own weight in food making them ideal to produce vermicompost. Although there are literally thousands of species of worms, only a few are used for vermicomposting. The epigeic and anecic species are particularly well suited for worm composting as these types of worms thrive on just about any kind of vegetable scraps, eating as much as their own weight per day. The two most common worms used for vermicomposting are the Eisenia foetida also known commonly as the Red Wiggler, and the red earthworm or Lumbricus rubellus. It is better not to buy random worms from fishing and bait shops or even garden centres and garden suppliers as they may not be the right sort of heavy duty consumers required to process kitchen waste fast and furiously. However, vermicomposting worms can be purchased from specialist suppliers or sometimes local species of earthworms can be used as these are excellently adapted to the local soil conditions. Worms are generally easy to look after and grow. Earthworms are hermaphroditic, that is each worm is both male and female and each can produce eggs and fertilise the eggs produced by another worm, but it takes two worms to produce offspring. A mature worm will produce an egg capsule every 7 to 10 days, each containing over one dozen hatchlings and capsules (cocoons or eggs). Once hatched, the newly emerged vermicompost worms reach maturity quickly in only two to three months, meaning that the worm population may double each month. However, worms are usually lost when the vermicompost is harvested or due to birds and other such predators feeding on them. Luckily, this rapid breeding rate means that the worm population easily adjusts to environmental conditions, and the food supply. Although vermicomposting does not require a balanced carbon-to-nitrogen ratio like aerobic composting, a proper diet will help maintain a healthy stock of worms. Worms are basically vegetarians and like to eat the vegetable wastes from your kitchen, yard and garden but can not eat non-degradable materials, such as glass, plastic, rubber or metals. Theses types of materials are not only bad for the worms, they are also bad for your compost pile so should be avoided. Vermicompost worms prefer relatively fresh foods like animal waste, plant biomass (leaf litter), plant cuttings or weeds, kitchen waste (fruit peels, vegetables), untreated paper or cardboard and the like. As worms do not have teeth only mouths, it does helps the worms and the decomposition processes if the harder more solid waste materials are broken or cut up prior to placement in the vermicomposting system, but it is not required. Worms like to be wet and need adequate moisture to help them breathe through their skin. The bedding used for vermicomposting helps retain moisture, reduces odours, and serves as food for the worms. It is also used as a retreat for the worms when the heat generated by the decomposition of the food waste becomes to high. Worm bedding should shelter vermicompost worms from direct sunlight so they do not dry out and overheat and give protection from predators. The bedding material should be loose consisting of approximately two-thirds topsoil and one-third decayed organic matter and can be made using animal manure, leaf mould, decaying leaves, newspaper strips, or shredded cardboard allowing it to contain the recommended moisture content. Vermicomposting worms are recognized to play an important role in the decomposition of organic materials. They are important because they are essential for soil health and decomposition of organic matter. Composts inoculate the soil with humus building microbes that convert these carbon compounds into humus (dark organic matter that also stores water) and worms facilitate this process. Growing earthworms on farms with livestock is often a successful way to generate vermiculture. Raising earthworms in the waste products of live stock and then feeding the animals with crops that have been grown with worm castings helps complete a nutrient cycle. Vermicomposting technology involves harnessing various species of worms as versatile natural bioreactors helping in the decomposition of organic matter, improving soil fertility and in bringing out efficient nutrient recycling enhancing a plants growth. A variety of organic solid wastes, domestic, animal, agro-industrial, human wastes etc can be vermicomposted. The value of vermicompost is further enhanced as it plays a role in reducing global climate change by improving the production of crops and cereals used to manufacture biomass and biofuels. Then we can think of Vermicomposting as a type of “global worming”. In the next tutorial about “Composting”, we will look at some of the Composting Bins available and their designs which can be used to contain and manage the compost within the garden instead of just a pile of soil on the floor. To learn more about how “Vermicomposting” works, to obtain more information about the various worms available for vermicomposting or to explore the advantages and disadvantages of composting with worms, then Click Here today to get your copy of one of the top “Worm Farming and Vermicomposting Guides” from Amazon and learn more about the different ways to produce good quality compost in your garden using the power of worms. hello .thank you for your information in the website. i’m going to run a farm producing compost and vermi and need for principal information for this. since you’ve been working for many years more than me,would you please give me some guides and experiences ,please? Vermicomposting is easy to do and set up in either pits or concrete tanks or well rings or in wooden or plastic worm boxes appropriate to your given situation. It is preferable to select a composting site under shade, and to prevent water from building up and stagnating in pits during heavy rains. Use the right types of worms, epigeics or anecic worms for your particular situation. Feed the worms with food waste, paper, cardboard, agriculture waste, manures, and biosolids. As well as bedding materials that provides the worms with a relatively stable habitat. DO NOT use meat or other fatty or greasy wastes, these will kill the worms. Vermicomposting can be performed all year-round, providing that environmental conditions remain within acceptable limits. Worms are oxygen breathers so rotate or aerate your worm pile.